The three EU global trade agreements CETA, TTIP and TiSA will have a huge impact on future global trade and investment rules, covering 53 countries, over 75% of the EU economy, 80% of the US economy and the majority of the global economy accounting for 2/3rds of global GDP. Public services have been included in all three agreements despite an unprecedented European and US public and trade union campaign to demand that public services are removed or ‘carved out’ from the treaties. 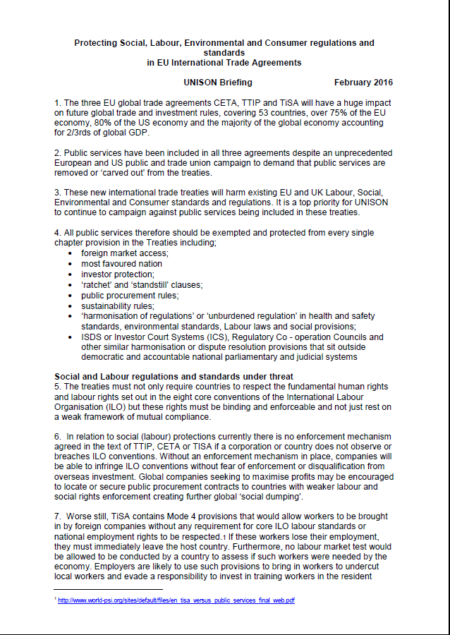 These new international trade treaties will harm existing EU and UK Labour, Social, Environmental and Consumer standards and regulations. It is a top priority for UNISON to continue to campaign against public services being included in these treaties.